Kum ba yah ("Come by Here") is a spiritual song first recorded in the 1920s. It became a standard campfire song in Scouting and summer camps and enjoyed broader popularity during the folk revival of the 1950s and 1960s. Come By Here / Kum Ba Ya / Kumbaya transcribed by the United States Library of Congress from a 1926 recording. According to Library of Congress editor Stephen Winick, the two earliest versions whose year of origin is known for certain were both collected in 1926, and both reside in the Library's American Folklife Center. No precise month or day was recorded for either version, so either may be the earliest known version of the song. One was submitted as a high school collecting project by a student named Minnie Lee to her teacher, Julian P. Boyd, later a celebrated historian. This version, collected in Alliance, North Carolina, is a manuscript featuring lyrics but no music. The other 1926 version was recorded on wax cylinder by Robert Winslow Gordon, founder of what began as the Library of Congress's Archive of Folk Song, which became the American Folklife Center. The singer's name was H. Wylie, and the song was recorded within a few hours' drive of Darien, Georgia, although Gordon did not note the exact location. Between 1926 and 1928, Gordon recorded three more versions of traditional spirituals with the refrain "come by here" or "come by heah". One of these is a different song concerning the story of Daniel in the den of lions. Of the other two, one has been lost, and one cylinder was broken, so it cannot be determined if they are versions of "Kumbaya". According to an article in Kodaly Envoy by Lum Chee-Hoo, some time between 1922 and 1931, members of an organization called the Society for the Preservation of Spirituals collected a version from the South Carolina coast. "Come by Yuh", as they called it, was sung in Gullah, the creole language spoken by the former slaves living on the Sea Islands of South Carolina and Georgia. It is possible this is the earliest version, if it was collected before 1926. Because the individual songs in this society's publications are not dated, however, it cannot be dated with certainty to before 1931. In May 1936, John Lomax, Gordon's successor as head of the Archive of Folk Song, discovered a woman named Ethel Best singing "Come by Here" with a group in Raiford, Florida. These facts contradict the longstanding copyright and authorship claim of Reverend Marvin V. Frey. Rev. Frey (1918–1992) claimed to have written the song circa 1936 under the title "Come By Here," inspired, he claimed, by a prayer he heard delivered by "Mother Duffin," a storefront evangelist in Portland, Oregon. 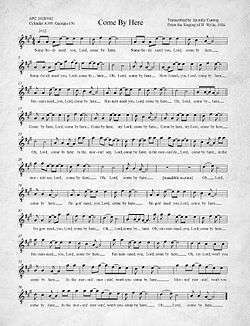 It first appeared in this version in Revival Choruses of Marvin V. Frey, a lyric sheet printed in Portland, Oregon in 1939. In an interview at the Library of Congress quoted by Winick Frey claimed the change of the title to "Kum Ba Yah" came about in 1946, when a missionary family named Cunningham returned from Africa where they had sung Frey's version. According to Frey, they brought back a partly translated version, and "Kum Ba Yah" was an African phrase from Angola (specifically in Luvale). Frey claimed the Cunninghams then toured America singing the song with the text "Kum Ba Yah". Although it is often claimed that the song originated in Gullah, Winick further points out that the Boyd manuscript, which may be the earliest version of the song, was probably not collected from a Gullah speaker. Winick concludes that the song almost certainly originated among African Americans in the Southeastern United States, and had a Gullah version early in its history even if it did not originate in that dialect. Joe Hickerson, one of the Folksmiths, recorded the song in 1957, as did Pete Seeger in 1958. Hickerson credits Tony Saletan, then a songleader at the Shaker Village Work Camp, for introducing him to "Kumbaya" (Saletan had learned it from Lynn Rohrbough, co-proprietor with his wife Katherine of the camp songbook publisher Cooperative Recreation Service, predecessor to World Around Songs). Joe Hickerson later succeeded Gordon at the American Folklife Center (successor to the Archive of Folk Song). The song enjoyed newfound popularity during the American folk music revival of the early to mid-1960s, largely due to Joan Baez's 1962 recording of the song, and became associated with the Civil Rights Movement of that decade. The Folksmiths including Joe Hickerson recorded the first LP version of the song in August 1957. As this group traveled from summer camp to summer camp teaching folk songs, they may be the origin of "Kumbaya" around the campfire. It was recorded by Pete Seeger in 1958, and The Weavers released it on Traveling on With the Weavers in 1959. The Journeymen had a minor hit in Vancouver in February, 1962. Joan Baez's 1962 In Concert, Volume 1 included her version of the song. Rabbi Shlomo Carlebach also sang "Kum Bah Yah" in a 1962 concert, a recording of which was subsequently released in 1963 on the album Shlomo Carlebach Sings. The Seekers recorded it in 1963 for their first album, Introducing the Seekers. They later re-recorded for their third album, Hide & Seekers (also known as The Four & Only Seekers); it was re-released on their 1989 album The Very Best of the Seekers. Ballad singer Tommy Leonetti gave the song chart status in 1969. His single reached #54 pop, #4 easy listening, released on Decca 32421. The song charted three years later for the Hillside Singers, reaching #117 in the Record World charts. It was included on The Sandpipers' 1969 album The Wonder of You. Raffi recorded it for his Baby Beluga album. In 1984, the proto-punk band Guadalcanal Diary recorded a version on their album walking in the shadow of the big man. In 1986, the Kidsongs Kids recorded it on their Kidsongs Video "I'd Like to Teach the World to Sing" for the African segment of the video. Peter, Paul & Mary recorded "Kumbaya" on their 1998 Around the Campfire album. Stacie Orrico used it in a short interlude on her 2000 album Genuine. German band Guano Apes and German comedian Michael Mittermeier recorded a rap metal cover of "Kum Bah Yah" called "Kumba Yo!" and made a music video ("Kumba yo!" on YouTube). The "Kumba yo!" single was released in 2001. "Sir-Ivan" released "Kumbaya" in about 2009. In 2013, Christian folk-rock band Rend Collective Experiment recorded a version as the opening track on their third album. In Peppa Pig, a British children's animated television series, 'International day' episode 8 of series 4, the lyrics "Peace and Harmony in all the world; Peace and Harmony in all the world; Peace and Harmony in all the world; Peace and harmony" are used. Recently (as of 2006), "Kumbaya" has been used to refer to artificially covering up deep-seated disagreements. We "join hands and sing 'Kumbaya'" or "it's all 'Kumbaya'" means we pretend to agree, for the sake of appearances or social expediency. After a private farewell dinner on December 5, 2006 at the White House for outgoing United Nations Secretary-General Kofi Annan (Secretary-General 1996 to 2006), soon-to-resign U.S. Ambassador John R. Bolton joked that "nobody sang 'Kumbaya.'" When told of Bolton's comment, Annan laughed and asked: "Does he know how to sing it?" In November 2007, Sol Trujillo, the chief executive of the Australian telecommunications company Telstra, mocked the proposed $4.7 billion taxpayer-funded, public-private partnership for a new national broadband network. He labeled it as some sort of "kumbaya, holding hands" theory. In September 2010, Christopher Pyne, the opposition's manager of business in the Australian House of Representatives said "This will not be a Parliament where all of its history is turned on its head and we all sit around smoking a peace pipe singing 'Kumbayah'." In March 2015 at the White House, Barack Obama said: "so this can't be reduced to 'let's all hold hands and sing "Kumbaya"'". He used the phrase to emphasize the difficulty in achieving peace between Israel and Palestine. October 9, 2016 the second U.S. Presidential Debate, Donald Trump and Hillary Clinton refuse to shake hands at the beginning of the debate. Karl Becker, an uncommitted voter and audience member, stood up and asked the two candidates a question, "Would either of you name one positive thing that you respect in one another?" "I respect his children," said Clinton. "I will say this about Hillary: she doesn't quit, she doesn't give up," said Trump. This has come to be known as the 'Kumbayah' moment of the election. In the movie Addams Family Values, Wednesday Addams is horrified when on a summer camp, in order to "encourage" her to participate in the camp activities, the group starts singing "Kumbayah, my Lord, Kumbayah!" The camp owners are later revealed to discriminate against the children based on class, race, and physical appearance. In the opening scene of the movie Friday the 13th, the camp counsellors are singing "Kumbaya" in front of a fireplace. In the movie Heathers, Veronica has a dream that Heather Duke has a funeral and Heather Chandler's spirit shows up and says, "My afterlife is so boring. If I have to sing 'Kumbaya' one more time I will spew burrito chunks." In the movie Troop Beverly Hills the song is sung several times. In the popular Canadian reality TV show Dragons Den, former Dragon Kevin O'Leary uses the song several times to poke fun at pitches that have a naïvely optimistic view of the world. In Jeff Dunham's Very Special Christmas Special. On Eekstravaganza!, Eek the Cat commonly exclaims "Kumbaya!" as one of his catchphrases, in keeping with his selfless personality. In the South Park episode "Volcano", Ned is singing the song while Jimbo plays guitar. "Kumbaya" was later referenced one more time in the "Something Wall-Mart This Way Comes" episode, when Randy leads a chorus singing "Kumbaya" while watching the Wall-Mart burn. In 2015 a web series by the name of Kumbaya! was released. In the opening cutscene of the game Resident Evil 4 the protagonist Leon, while talking to some cops, says, "I'm sure you boys didn't just tag along so we can sing Cumbaya together at some boy scout bonfire. Then again, maybe you did." In one mission of Episodes From Liberty City, the expansion pack for Grand Theft Auto IV, Billy Grey, the leader of The Lost biker gang, replies sarcastically to Johnny Klebitz (the protagonist) complaining about the club's infighting, saying: "Yeah, you're right we should probably all get into a circle, hold hands, pray, and sing Kumbaya." In The Neverhood, during one puzzle involving tuning a radio, one radio station introduces itself as "Sound Effects Record #33: Man, Facing Backwards, Taking A Shower." The ensuing audio is a reversed recording of a man (presumably the voice of musician Terry Scott Taylor) singing Kumbaya, while water is heard running in the background. The audio can be heard on the official soundtrack album Imaginarium: Songs from the Neverhood, as track 32 on disc 1. 1 2 3 4 5 6 7 Winick, Stephen (Summer–Fall 2010). "The World's First 'Kumbaya' Moment: New Evidence about an Old Song" (PDF). Folklife Center News, Library of Congress. Retrieved March 1, 2014. 1 2 3 4 Jeffery, Weiss (November 12, 2006). "'Kumbaya': How did a sweet simple song become a mocking metaphor?". The Dallas Morning News. Archived from the original on September 14, 2008. Retrieved July 17, 2008. ↑ "Mama Lisa'a World-Kumbaya". Retrieved November 1, 2008. 1 2 Stern, Gary (June 27, 2009). ""Kumbaya, My Lord:" Why we sing it; why we hate it.". The Journal News. Retrieved February 1, 2010. ↑ Amy, Ernest F. (1957). Cooperative Recreation Service: A unique project. Midwest Folklore 7 (4, Winter): 202–6. ISSN 0737-7037. OCLC 51288821. ↑ Zorn, Eric (August 31, 2006). "Someone's dissin', Lord, kumbaya". Chicago Tribune. Retrieved January 11, 2008. ↑ Mitra (September 6, 2009). "Kumbaya" (in English and Persian). YouTube. ↑ "Kumbaya, my Lord" (PDF). evangeliser.nu. Retrieved 2 December 2015. ↑ Sacro Capo (March 11, 2009). "Kumbaya my Lord". YouTube. ↑ Sir Ivan and I am Peaceman (August 29, 2009). "Kumbaya". ↑ Goldenberg, Suzanne (December 12, 2006). "Annan bows out of UN with attack on Bush". December 12, 2006 : The Guardian. London. Retrieved December 12, 2006. ↑ "Telstra rejects Labor net plan". Australian IT. December 6, 2007. ↑ "Insults start to fly from furious Coalition". Sydney Morning Herald. September 8, 2010. ↑ "Issues: Afghanistan Troop Level; China and AIIB; US-Israel Relations; Ted Cruz Candidacy". TMG Library: Transcripts. The McLaughlin Group. March 27, 2015. OBAMA: What we can do is pretend that there's a possibility of something that's not there, and we can’t continue to promise our public diplomacy based on something that everybody knows is not going to happen, at least in the next several years. We believe that two states is the best path forward for Israel’s security, for Palestinian aspirations, and for regional stability. That's our view, and that continues to be our view. And Prime Minister Netanyahu has a different approach. And so, this is -- this can’t be reduced to a matter of, somehow, let’s all -- you know, hold hands and sing kumbaya. ↑ Korte, Gregory (March 24, 2015). "Obama says Netanyahu differences go beyond 'Kumbaya'". USA Today. ↑ "Trump and Clinton name one positive thing about each other". ABC7 Chicago. 2016-10-10. Retrieved 2016-10-10. ↑ "Winners and losers in the 3rd Democratic presidential debate". www.msn.com. Retrieved 2016-10-10. ↑ "Minions film review: Kevin, Stuart and Bob are this summer's unholy trinity". 26 June 2015. What does 'Kumbaya' in the song 'Kumbaya, My Lord' Mean?